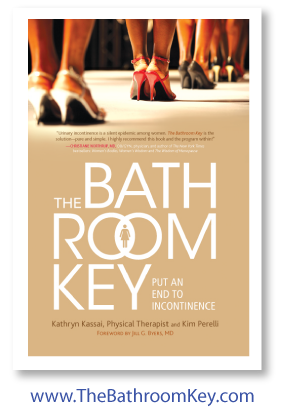 This wonderful new book, THE BATHROOM KEY, is a treatment plan for women to cure their own incontinence. It also allows women to identify with other women through the anecdotal stories that echo their feelings of isolation and embarrassment. The physical therapy treatment described in this book is not just for incontinence, but also for urinary frequency, organ prolapse, and pelvic pain, using surface EMG biofeedback, bladder re-training, pelvic floor exercises, Pilates, and dietary changes. Written in easy-to-understand language, the book is a genuine teaching tool, guiding the reader to a better understanding of her body and effective remedies. We at Praxis Physical Therapy, with the help of author Kathryn Kassai, have successfully cured thousands of patients with the methods described in this book. If you have any of these problems, we want to help you. Don’t endure it, cure it! “Urinary incontinence is a silent epidemic among women. The Bathroom Key is the solution – pure and simple. I highly recommend this book and the program within! “The Bathroom Key is a wonderful resource for any woman with symptoms of urinary incontinence, pelvic prolapse, or pelvic pain. I love the way Kathryn and Kim use real patients as examples throughout the book and explain everything in plain language.